•CUNSE has its own crystalline silica mine in Tie men Town which is famous for its silica mine. •High purity, good thermal conductivity, high refractoriness under load and high tridymite content, low true density, low expansion, low creep and low residual quartz content, good dimension and appearance. •Widely used in hot blast stoves. •Used in high temperature sections of the checker chamber in hot blast stoves. •Used as low-cost alternative to andalusite and mullite checker bricks in hot blast stoves. •High refractoriness, average thermal shock resistance makes it suitable in consistent temperature environment. Fumigated wooden pallet, using paper or non-woven fabrics between layers separated, plastic shrink film protected outside.finaly using straps. The size of wooden pallet is 95x95cm, 95x100cm or as your requirements. Delivery Detail: 45-90 days accoding to the order. 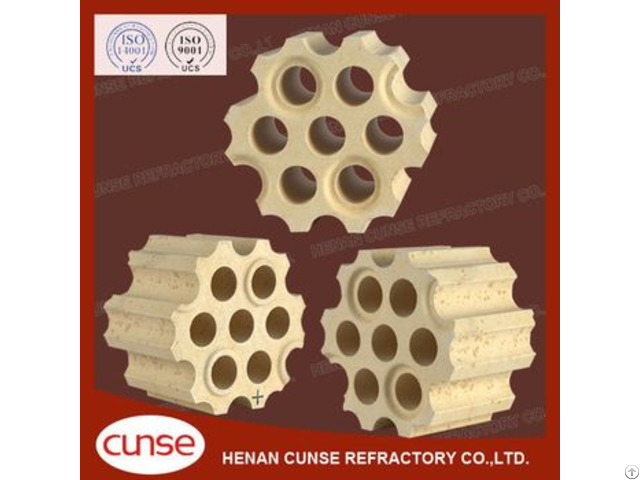 Posted By: Henan Cunse Refractory Co., Ltd.
Business Description: CUNSE is the leading supplier of quality silica bricks, high alumina bricks, and insulation bricks, monolithic and related products in China. CUNSE’s products are widely used in the major iron and steel plants including SHOUGANG GROUP, ANSETEEL GROUP, Oita steelmaking plant, JFE etc. CUNSE is focused on refractory materials including design, research, manufacturing, testing, and installation for iron and steal plants for more than 20 countries.